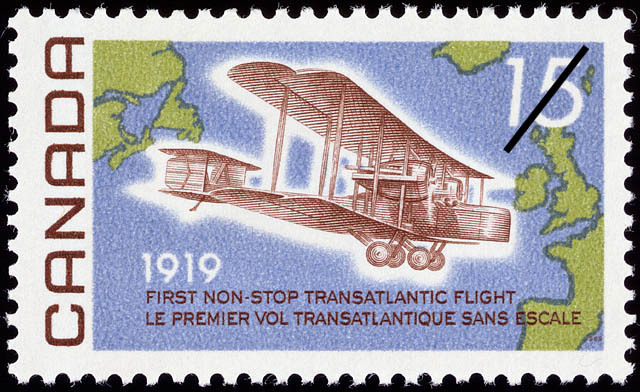 The value of a First Non-Stop Transatlantic Flight, 1919 - 15 cents 1969 stamp depends on several factors such as quality and wear, supply and demand, rarity, finish and more. Values in the section are based on the market, trends, auctions and recognized books, publications and catalogs. This section also includes information on errors and varieties and characteristics. From a take-off in Newfoundland, a land now Canadian by the choice of her people, two aviators wrote history in 1919 by completing the first non-stop transatlantic flight. The flight came 100 years after the American brig Savannah, in June 1819, became the first vessel fitted with steam engines to accomplish the same purpose; people at Clifden, Ireland, where the plane landed, were as unbelieving as the crew of an Irish cutter had been mystified in 1819 when outdistanced by the baremasted arriving Savannah. On May 28, 1919 the twin-engined British Vickers Vimy plane arrived at St. John's; after assembly at Quidi Vidi Lake it was, on 9th June, given a first Newfoundland test in a flight to a suitable lift-off area, Lester's Field. One more test flight preceded the historic 14th June 1919 take-off. Passing over the Newfoundland coastline at some 1200 feet the crew of two and their plane headed eastward over the troubled Atlantic where they were to require the greatest of courage and determination; aboard were John Alcock, a native of Manchester, England, born in 1892, and Arthur Whitten Brown, born at Glasgow, Scotland, in 1886. A comparatively short time had elapsed when dense fog necessitated navigation by dead reckoning; already flying blind, the crew's communications were silenced and their electrically heated suits rendered useless when blades of the wind driven generator sheared off. White hot metal from a split exhaust was one of many hazards overcome. Near dawn, in a tremendous storm, Alcock and Brown were forced downward to an almost calamitous 60 foot elevation. As time wore on rain and sleet changed to snow whereupon Brown unhesitatingly clambered from his open cockpit to edge along the fuselage wielding a knife to chop the gathering ice. Some 80 miles from Ireland the adventurers passed into clear skies still trying to free choking vital controls. Alcock set his machine into a glide searching for the layer of warmer air which he found at the 200 ft. level; soon thereafter, at 8:25 a.m., the coast was passed. Weather conditions cancelled plans to fly to London, therefore, the decision was made to set down on what appeared to be a grassy meadow; the meadow proved to be an Irish bog in Co. Galway where the plane came to rest at 8:40 a.m., June 15, 1919, tail-up and nose buried in the wet earth. Uninjured, Alcock and Brown completed their crossing at an average speed of about 112 m.p.h. Various authorities report minor differences in distance and elapsed time, however, an Historic Sites and Monuments Board of Canada bronze plaque in Newfoundland records the flyers: took off nearby on the first non-stop Transatlantic flight in a Vickers 'Vimy' aeroplane at 12:58 p.m. Newfoundland time. Sixteen hours and twelve minutes later they landed in Clifden, Ireland, a distance of 1,800 miles. Both knighted by King George V, Alcock and Brown had earlier, from the hands of Winston Churchill, the Secretary of State for War and Air, received an award of 10,000 pounds. Alcock died in an air accident on December 18, 1919; Brown died in 1948 at his home in Wales. The Vickers Vimy remains on display at the Science Museum in South Kensington, England.